The United Nations blamed Israel for a burgeoning humanitarian crisis, including deaths, injuries and harm to children, from its offensive in Gaza in a strong statement released Saturday. The three-page statement, listing charges separately from six UN-affiliated agencies, called for "urgent action" to halt the rapid deterioration. Israel rejected the charges. 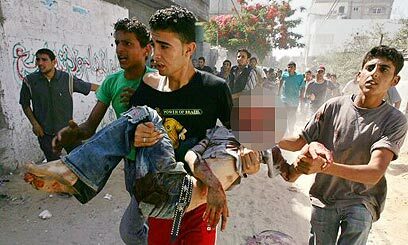 The statement charged that Israel's military offensive has caused mass violations of human rights of civilians in Gaza. Some result from an Israeli attack that destroyed the main Gaza power station, others from the closing of vital crossing points and the rest from military operations, it said. The world body expressed alarm over events in Gaza "which have seen innocent civilians, including children, killed, brought increased misery to hundreds of thousands of people and which will wreak far-reaching harm on Palestinian society." Among the specific issues listed, the statement said Gaza is "on the brink of a public health disaster," including a shortage of medicines. Also, children in Gaza "are living in an environment of extraordinary violence, insecurity and fear." In one of the six sections, from the Office of the High Commissioner for Human Rights, the statement faults the Palestinians while implying that Israel is hitting civilians on purpose. "The prohibition on targeting civilians is also being violated by Palestinian armed groups, launching missiles from the Gaza Strip into Israel, and must therefore end," it said. The UN document does not mention the incident that set off the Israeli operation - a June 25 attack by Palestinian terrorist who tunneled under the border into Israel and attacked an army post, killing two soldiers and capturing a third. "Unless urgent action is taken," the statement concludes, "we are facing a humanitarian crisis that will have far-reaching consequences." Israeli Foreign Ministry spokesman Yariv Ovadia denied there is a humanitarian crisis and said the Israeli operation "has been tailored to avoid civilian casualties while bringing sufficient pressure to bear on the Hamas-led government of the Palestinian Authority" to order release of the soldier and halt the rocket attacks. He said Israel is allowing transfer of fuel and food into Gaza through crossing points from Israel "despite continued attempts by terrorist groups to attack these facilities." The Israeli official rejected the premise of the UN statement, that Israel was to blame for the hardships in Gaza. "The Palestinian terrorists purposely manufacture, store and fire missiles at Israeli civilians from the midst of their own population," he wrote. "It is they themselves who bring suffering upon their own people by using them as shields for their terrorism," also blaming the Palestinian people for electing a government led by "Hamas, a murderous terrorist organization." In a specific demand, a UN agency said Israel must repair the power station it destroyed. "With the bombing of the electric plant, the lives of 1.4 million people, almost half of them children, worsened overnight," said the world body's humanitarian affairs office in the statement. See all talkbacks "UN blames Israel for Gaza humanitarian crisis "